For the detection of suspended and separated free water in diesel, bio-diesel, bio-diesel blends, off-road fuel, jet fuel and kerosene. Each self testing and result kit costs $12. Step 1. Empty the small tube of dry powder medium 2oz tube of liquid; shake well until completely mixed. Step 2. Fill the 2oz tube with fuel until it’s filled to the top of the label. Step 3. Replace and tighten the cap of on the sample and vigorously shake until mixed well. Step 4. Let the sample stand for 5 minutes. Step 5. Holding the bottle upright, do a visual inspection of the contents at the bottom of the bottle. You will see particles from the Medium settling on the bottom of the bottle. 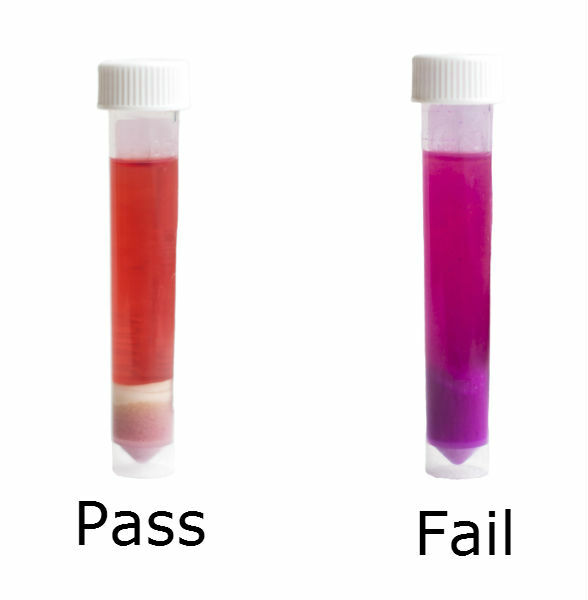 FAIL: Particles turn pink (dark purple in dyed fuel). This may indicate that your fuel contains water exceeding 500ppm. After you have read and recorded your results, dispose of fuel in accordance to local and state regulation and guideline. Give us a call with any questions… (800) 546-4451. We are excited to introduce this new product into the market place, we believe that this field test for Microbial Growth has many applications that will be a benefit to your company. Below are the testing instructions for your review. If you have any questions or if there is anything we can do for you please give us a call. Obtain your fuel sample from vehicle, storage tank or filler nozzle.